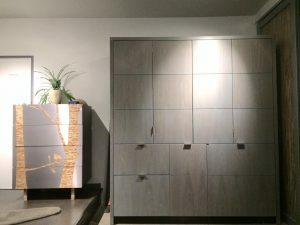 The Stealth Kitchen Modules line is so versatile that in addition to its ability to completely hide all things that indicate ‘kitchen’, it can be used to create beautiful freestanding custom pieces as well. 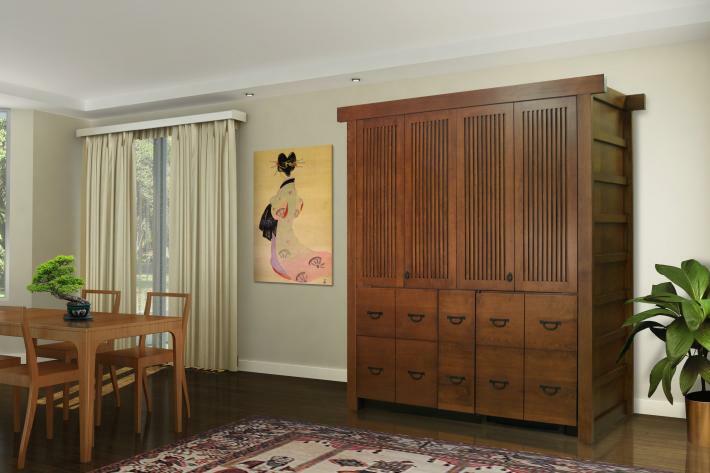 Here a Stealth Compact Kitchen UK72 was surrounded by custom exterior side panels and outfitted with custom grid doors so that it would blend in with the client’s other Tansu style furnishings. Designed for an open plan office/studio/kitchen, this piece offers a complete kitchen in a very small package. The key difference between our other Mini-kitchen line and the Stealth line is that the counter top edge is no longer visible. With the edge of the counter top concealed, you can see how the UK72 module can combine with other Stealth modules to make even bigger mini-kitchens, either built-in or completely freestanding like this one. 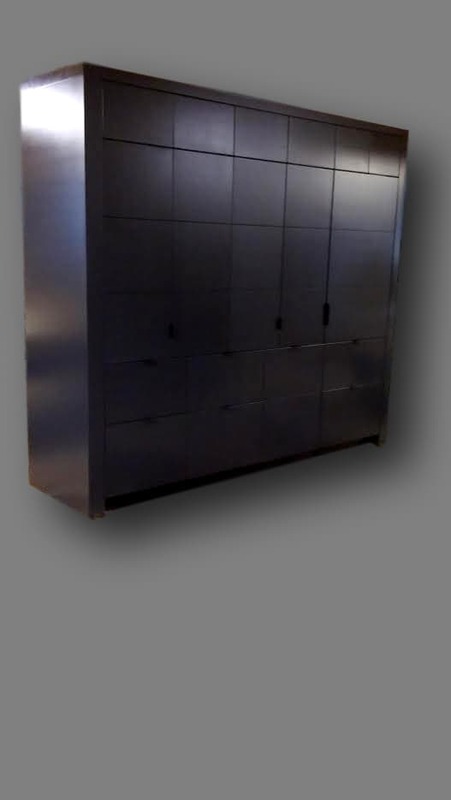 A full height refrigerator module and/or a full height pantry module can flawlessly combine with the basic UK72 module to meet all kinds of needs. Built-in modules can even turn corners, with a combination of modules on one wall and another module attached but perpendicular to them built into another wall. This image shows the UK72’s pocket bi-fold doors opened to reveal the counter top with storage areas above, 2 burner ceramic cook top, 18 ga. stainless steel sink, and GE’s incredible Advantium oven/exhaust hood, the oven that can cook anything. YesterTec’s UL Listed safety features do not allow the oven and cook top to operate when the bi-fold doors are closed in front of them. Below the solid surface counter top is the refrigerator/freezer, single drawer/dishwasher and more storage areas. The UK72’s extra depth (3” deeper) allows for more storage and counter space than our other Mini-kitchen line. The Mission Style quartersawn oak Stealth C72-24 Compact Kitchen shown below includes a 240V four burner cooktop, a 240V 24″ wall oven and a 120V over-the range oven/hood in addition to an oversized sink. 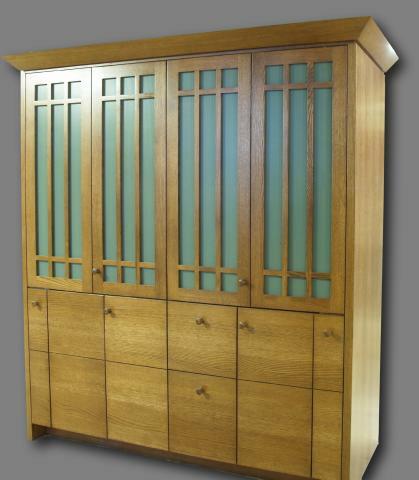 Its Mission style features include custom grid doors and a bevel crown. The UK72 Mini-kitchen below was finished in a custom stain to match other elements in the minimalist guest room. The Stealth Kitchen below finished in Black includes a UK72 mini-kitchen, an R-24 refrigerator module and a band of upper storage modules across the top. Two inch thick trims and side panels surround the entire mini-kitchen. Click here to see the UK72 and the MK72 (Master Kitchen) Selection Sheet. Dimensions for the basic UK72 are 29” deep, 72” wide and 80” tall. Side panels and the crown molding add to these dimensions. All Module interiors are finished in clear (unstained) maple. All appliances can be 120V, eliminating the need for 240V power. However, certain 240V cooktops and ovens can be used as noted in the above mini-kitchen. Click here to see some examples of how custom crown molding, door and drawer panel designs can be used to create some very distinctive kitchens. Considering all of the available styling options, our Stealth Kitchen Module line is our most versatile line to date. From a one piece mini-kitchen to an entire full sized kitchen, these modules can help you create focal point kitchens or kitchens that simply recede into the background. We hope you will enjoy designing your Alternative style kitchen with this amazing new design option. 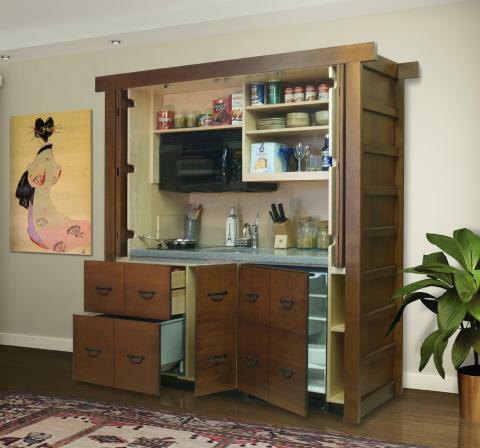 * This Stealth Kitchen won Platinum, the top award from Design Journal’s 2011 Award for Design Excellence competition. The Armoire was gleaned from thousands of entries and earned the coveted ADEX Award based on a force-ranking of form, function and fitness for a particular purpose.